(MP080). Alma Claude Burlton Cull (1880-1931). Watercolour signed and dated 1912. This magnificent painting of the battleship TEMERAIRE, the fourth of the name to serve in the Royal Navy, and which was first commissioned in the summer of 1909 evokes, with its wild sunset colours, JMW Turner’s immortal The Fighting Temeraire’. 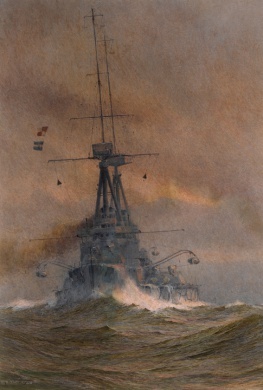 Cull’s TEMERAIRE, - painted here in 1912  was a dreadnought of the Bellerophon Class and had recomissioned in Devonport on 11 May 1911 under the command of Captain Reginald Allenby RN whose brother was to become a distinguished general of the Great War. Appropriately for a ship which bore a famous name from Trafalgar days, her second-in-command was a Commander Charles Hardy. Together with her sisters and half sisters DREADNOUGHT, BELLEROPHON, SUPERB, COLLINGWOOD, ST VINCENT, and VANGUARD she was a member of the First Battle Squadron, First Division, Home Fleet whose flagship, NEPTUNE, wore the St George’s Cross of the Commander-in-Chief Home Fleet, Admiral Sir George Callaghan KCB KCVO.